Percius Mercius is an Imperial drillmaster and a Guardian in the Fighters Guild. Percius, an all around "good guy" and former Master of the Fighters Guild, is the main quest giver of the Ald'ruhn Guild of Fighters. You may go to him for guidance about other Fighters Guild quests. His early quests deal with normal Fighters Guild issues, while his later quests deal with the cleansing of the Fighters Guild, which has been overtaken by the Camonna Tong. Afterwards, he settles down and lets you run the guild with honor. Caius Cosades knows and trusts him. He is a thoroughly honest man, and you can ask for his advice on many quests from his more morally ambiguous colleagues. He is wearing a near full set of netch leather, including the cuirass, both pauldrons, both gauntlets, greaves, boots, and shield. He is also wearing common pants and he is wielding a steel broadsword of hewing. He is carrying an iron key which opens a few locks in his private quarters. Aside from his natural charm and ability to absorb fatigue from others, he knows no spells. "Do you have any new information on the situation in Vas? You should speak to Ulyne Henim." "I sent you to take care of Nerer Beneran. Have you had any success with that yet?" "What's the status of those bandits in Suran? Have you had a chance to speak with Serjo Avon Oran yet?" "Have you delivered that flin to the Elith-Pal Mine yet? It is important that it be delivered there as soon as possible, %PCRank." "We've spoken about the problems with Eydis Fire-Eye already, as well as with Lorbumol gro-Aglakh. Tell me what you have done about the situation." "Have you settled the matter of Sjoring Hard-Heart yet? I pray that this business is ended soon." "Adraria Vandacia is an Imperial tax agent. I don't know why Lorbumol gro-Aglakh would give you a bounty on her. I can only suggest that you disobey orders and do not kill her. If you decide not to kill her, you will likely get no further orders from Lorbumol. He is cruel, petty, and single-minded." "Adraria committed no crime. There was no reason to kill her." "Having been Guildmaster, I have a good feel for which way the wind is blowing. If you receive any orders that seem out of the ordinary to you, let me know. I'm more than willing to help out." "Now that you are Guildmaster, rule the Guild wisely. Use your wisdom, experience, and judgement to the Guild's benefit. Remember those who helped you to attain your rank. If I was even a small part of your success, I feel honored. You will do well." "These orders you've been given seem okay with me. Just try not to kill Sottilde to get that book. I've heard she's a pushover. I'm sure you can convince her to hand it over." "I'm glad you didn't resort to violence." "You didn't have to kill Sottilde." "You can get the debt money from her, or you can pay it yourself. Manos Othreleth works for Orvas Dren, so I suspect this may not be a legitimate Fighters Guild contract." "If you have questions about any other orders you get, just ask." "You didn't have to kill her, %PCName." "It was not Lirielle Stoine who owed the money, but her brother Ranus [sic] Stoine. Ranus was murdered, and I don't think Lirielle has 2000 septims. You'll have to either find the gold Ranus [sic] Stoine had or pay the 2000 septims yourself." "I have heard of this Khajiit, and he is a known outlaw. I believe that this bounty is a legitimate one, %PCRank." "It seems straightforward to me. Dura gra-Bol really is wanted for murder." "You've already killed Dura gra-Bol. If you have questions about any other contract, ask them." "You can find her at the Guild of Fighters in Balmora. Kill her and report back to me." "Good work, %PCName. You must also kill Lorbumol gro-Aglakh before the Fighters Guild can free itself from corruption." "Now that Eydis Fire-Eye and Lorbumol gro-Aglakh are dead, you must take the battle to Sjoring Hard-Heart." "Don't let your conscience trouble you, %PCName. You did the right thing." "Eydis Fire-Eye used to be one of Sjoring Hard-Heart's supporters, but something changed her mind. We don't have to worry about her anymore, just kill Lorbumol gro-Aglakh." "Regretably, you broke the rules of the Fighters Guild and you have been expelled. First make amends, and then I can speak with you about this again." "I used to be the Master of the Fighters Guild, but took the opportunity to retire here in Ald'ruhn. Do you want to join the Fighters Guild? We're always looking for recruits." "Things have really gone bad since I was the Master of the Fighters Guild. Sure, Sjoring Hard-Heart's a good fighter, no one disputes that. But I've heard he's been making deals with the wrong crowd. But I've said too much already. Maybe when you've proven yourself we can talk again. "I used to be the Guildmaster. That position now belongs to Sjoring Hard-Heart. He's taken the Fighters Guild in some questionable directions. He's got too many followers in the high ranks, and I can't do much from here to keep the Fighters Guild honest. You can trust me, and you can trust Hrundi in Sadrith Mora. He's not in Sjoring's pocket yet." "So you work for the Thieves Guild too? Hmph. I'll tell you what I know. Hrundi in Sadrith Mora used to be my second in command. He's a good man, and he might be persuaded to join your cause. I hesitate to suggest this, but I trust you. Hrundi has a lover. A Dunmer, from what I hear. If you find her, you can convince Hrundi to join your cause. Eydis Fire-Eye is a good fighter, but there's always been something dark about her. I found out just recently what that was. She's a worshipper of Clavicus Vile. I don't know how you can use this information. I'm sure she can't be blackmailed. The new Master of the Fighters Guild is Sjoring Hard-Heart. He owes too much Camonna Tong money to back out now. There's no way you can convince him. You'll have to kill him." "I've told you all I can." 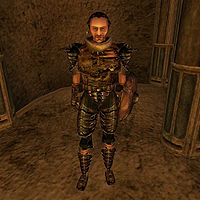 "Lorbumol is in the Guild of Fighters in Vivec. Kill him and report back to me." "Good work, %PCName. You must also kill Eydis Fire-Eye." "Now that Eydis Fire-Eye and Lorbumol gro-Aglakh are dead, you must take this battle to Sjoring Hard-Heart." "Now that Lorbumol gro-Aglakh is dead, you must take this battle to Sjoring Hard-Heart." "The Fighters Guild is better off without him." "Regretably, you broke the rules of the Fighters Guild and you have been expelled. Make amends and we'll speak of this again." "I don't have much work for anyone under the rank of Swordsman. These Redorans are honorable enough, and they keep things pretty quiet around here. If you ever need any advice or have any questions about the orders you get, come talk to me. I used to be the Guildmaster. There's a few things I might tell a promising %PCRank. Seek Eydis Fire-Eye in Balmora to get your feet wet or Hrundi in Sadrith Mora if you're up for some challenges. You may also speak with Lorbumol gro-Uglakh in Vivec for your orders." "Sometimes we get a contract from one of the locals and sometimes they're a bit strange. Ulyne Henim, a young Buoyant Armiger, has hired us to provide some extra muscle to clean out a den of Necromancers known as Vas." "The Fighters Guild often enacts justice when there is no one else who can do so. I just received a contract straight from Cyrodiil. I need someone to find the murderer and outlaw Nerer Beneran." "Serjo Avon Oran of Suran has given us a contract. He's been having problems with bandits in Suran. "I have a small task for you. The Empire charges the Fighters Guild with keeping the forts and mines supplied. Would you be willing to take a load of flin to the Elith-Pal Mine?" "Come back a talk to me when you're a Guardian in the Fighters Guild. I've been impressed with your work so far, %PCName. I'll tell you more when I can. You might want to check with Hrundi in Sadrith Mora. He's a good man, and you can trust him." "The only way to save the Fighters Guild from the corruption of the Camonna Tong is to get rid of Sjoring Hard-Heart and those loyal to him. If you kill his chief supporters, Eydis Fire-Eye and Lorbumol gro-Aglakh, I'll put my own life on the line and support you as the new Guildmaster." "The only way to save the Fighters Guild from the corruption of the Camonna Tong is to get rid of Sjoring Hard-Heart and those loyal to him. I heard Eydis Fire-Eye was no longer one of his chief supporters, but Lorbumol gro-Aglakh still needs to be dealt with." "There is one more thing you must do, %PCName. Once you have done this, I will name you Guildmaster. You must kill Sjoring Hard-Heart." "You've already done more than I could have hoped for." "Killing an Imperial Magistrate is a serious offense. All I can suggest is to disobey orders and refuse this contract." "You shouldn't have killed him, %PCName." "There is one more step to freeing the Fighters Guild from corruption. You must kill the Guildmaster Sjoring Hard-Heart. Take this key, %PCName. It will let you into my private rooms. In the chests you will find two suits of armor. They were mine from years ago. They may help you fight Sjoring Hard-Heart. In spite of his faults, he's one of the best warriors in Vvardenfell, so be careful. He'll likely be in the Fighters Guild in Vivec, and he'll be expecting you." "You must kill the Guildmaster Sjoring Hard-Heart. He'll likely be in the Fighters Guild in Vivec, and he'll be expecting you." "You have saved the Fighters Guild from Sjoring Hard-Heart and his allies in the Camonna Tong. As I promised, I am naming you the new Guildmaster. Congratulations, Master %PCName." "Sjoring is already dead? I'm glad to hear it, %PCName. You've saved the Fighters Guild from the corruption of the Camonna Tong. As I promised, I am naming you the new Guildmaster. Congratulations, Master %PCName." "Although Sjoring Hard-Heart is dead, we must not rest easily. I fear there are troubling times ahead, not just for the Fighters Guild, but for all of Tamriel. Be wary and always ready for the threats yet to come. Use your position as Guildmaster to try and protect the Fighters Guild, not by allying with such as the Camonna Tong, but with hard work and high standards." "Regretably, you broke the rules of the Fighters Guild and you have been expelled. Make amends, and then I can speak with you about this again." "What is Tongue-Toad's crime? I don't know that it's right to kill him. Maybe you could convince him to leave instead." "I'm glad you spared Tongue-Toad. No one should die for telling the truth." "Well, you must do what you feel is right." This page was last modified on 8 February 2018, at 00:02.